The striking, weather-beaten and feature-filled face that gazes intently back at us from this image does so across more than 150 years of history. A product of the 1860s, the photograph was created as a result of the American Civil War, but the story of the man it captured extends far beyond that bloody struggle. Indeed, perhaps it’s most remarkable aspect is what the subject represents. 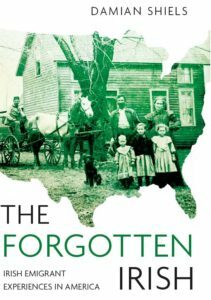 Not only has it captured in vivid detail a working-class Irish emigrant, but this is also a rare likeness of an ordinary man who we know departed his homeland before the onset of the Great Famine, and the mass exodus that ensued. His name was Martin Kelly. Martin Kelly (sometimes Kelley), whose image forms part of The John Paul Getty Collection, was born in Co. Roscommon on 19th April 1819. 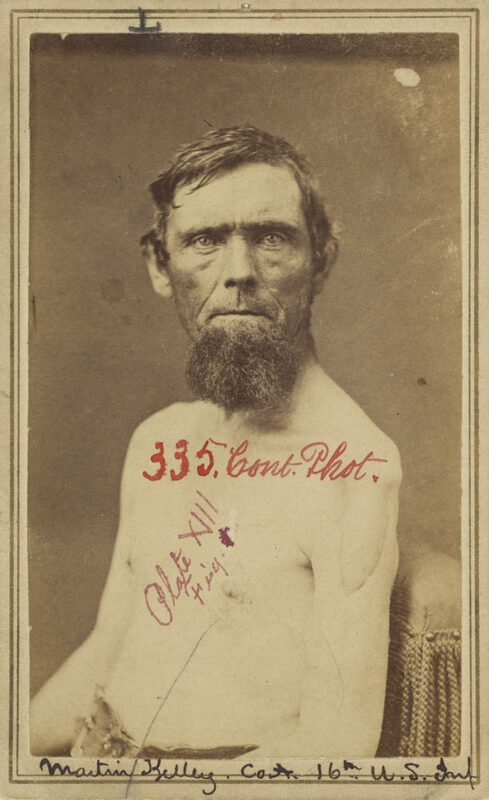 He was in his forties by the time this albumen print was created, captured in order to record a wound Martin had received to his left arm during the Civil War. Along with his injury, Martin’s features betray a life of toil, hard graft, and exposure. Examination of his story quickly uncovers the cause. Though we do not know what year Martin emigrated to the United States, we do know he was there by the late summer of 1841. On 16th August that year the laborer presented himself to a recruiting officer in New York, from where he was assigned as a private to Company K of the 2nd United States Infantry. So began a long association with the American military that would be a recurring feature of his life. Martin may have had his first taste of action not long after his enlistment, as at the time he joined up his regiment was engaged in actions against the Native American Seminoles of Florida. But by June 1842 Company K were back in New York, where Martin was stationed at Buffalo Barracks on Lake Erie. They stayed there for most of his five-year-term of enlistment, before moving to Fort Wilkins, on Lake Superior’s Michigan shoreline. Before Martin had left Buffalo, he had tied the knot. On the 23rd January 1844 he wed English-born Susannah F. Prior at the city’s First Presbyterian Church. It is not clear if this had been Martin’s original religion, or if he had converted from Catholicism. Susannah likely went with Martin to Fort Wilkins, and it was there on 20th June 1846 that the Roscommon native elected to extend his stay in the army, re-enlisting for a further five years. It proved a momentous decision. Within weeks Company K–and Martin– were heading South to participate in the Mexican-American War. Reaching the Rio Grande in late September 1846, the first major engagement in which Martin participated was the March 1847 Siege of Veracruz. This was followed by actions such as those at Cerro Gordo and Contreras, and Martin and his comrades were among those who entered Mexico City that September. With the war over, he and Company K left Mexico in March 1848 for New York (and likely Susannah), but within months they were on the move again– this time for California. It was here that Martin’s second term came to a close. After ten years service, he was discharged on 20th June 1851, while stationed at Fort Miller on California’s San Joaquin River. The links Martin and Susannah had in Buffalo no doubt drove their decision to make their home there afterwards, and in 1855 their daughter Irene was born in the state. Whether Irene was their only child, or the only one who survived to adulthood, is unclear. In 1858, more than seven years after he had last served, Martin decided to return to the army. He made sure to rejoin his old regiment, the 2nd United States Infantry, joining up once more with Company K at Fort Abercrombie in modern-day North Dakota. Reassigned to Company C in 1859, the start of 1861 found Martin at Fort Ripley in Minnesota, before the growing crisis in the East led to their redeployment. By the time he got to Washington D.C. Martin had to to be admitted to hospital, suffering from haemorrhoids, an ailment that caused him to miss the Bull Run campaign. He soon departed his old regiment, being reassigned as a steadying hand to the newly formed 16th United States Infantry, where he became a private in Company B of the 2nd Battalion in November 1861 and then Company A of the 1st Battalion at the end of 1862. Martin spent most of his Civil War Service in the Western Theater. It was to be at the Battle of Stones River, Tennessee on 31st December 1862 that his luck ran out (you can read about the experiences of Irish Regulars at Stones River here). During the fighting there Martin was struck in the left arm by a Rebel bullet, which entered his shoulder from the front left, before passing out through the lower part of his shoulder blade. In an effort to save his arm, surgeons removed the head and upper third of his humerus, though his limb would be permanently useless. It was while recovering from this wound that the medical image of Martin was taken, in which the scar tissue on the Roscommon’s native’s left arm ins clearly visible. He was discharged at Nashville, Tennessee on 7th March 1863, having been supplied with an artificial apparatus to help him to move his arm around. Martin received a pension of $8 per month dated from 17th August 1863. Returning to his wife and daughter in Buffalo, the family soon took the decision to make their lives permanently in Washington D.C. The reason for this seems to have been based on Martin’s long military service and the excellent opinion of him held by former officers. This was surely instrumental in his securing a position as a Clerk in the Treasury; he worked there at the time of the 1870 Federal Census, with the family living in Washington’s First Ward. Ten years later the family were at 1008 New Hampshire Avenue North West, with Martin still in the Treasury Department, now working as a messenger. Martin’s change of roles may well have been due to increased problems he was having with his Civil War wound, problems that would haunt him until his dying day. The army’s high regard for Martin Kelly, and their acknowledgement of their debt to him, were also surely behind their acceptance of the old soldier for a remarkable fourth term of service. The Army Register of Enlistments notes that on 1st March 1881 the 61-year-old was enrolled as a messenger for general service in the Adjutant General’s Office. He was discharged on 11th August 1882 by order of the Secretary of War, with his character being described as “very good.” The support did not end there. In 1882 a new Chairman of the House Military Affairs Committee was appointed– a certain Congressman William Rosecrans, who also happened to be Martin’s old commanding General. Rosecrans put forward a special bill to have Kelly’s pension increased, which was approved in 1884 (Though Martin’a arm was useless, because it had not been amputated he had not been receiving the level of monies he might otherwise have been entitled to). Unfortunately these interventions would not be enough. In 1875 Martin’s Doctor had reported how his wound was witnessing the formation of recurring abscesses, for which he had been treated a number of times. On one occasion the abscess had remained open for weeks. By 1885 the situation had worsened considerably. Dr. James T. Sothoron treated the Irishman in July, August and September of that year for insomnia, the wound to his left arm, neuralgia of the left arm, and gastric cattarh. Despite his efforts, on 24th October 1885 Martin died. The official cause of death provided was “old gunshot wound of shoulder”, together with gastric cattarh, albuminuria, uremia, and exhaustion. Ultimately the wound which caused Martin Kelly’s image to be preserved for us contributed directly to his death, almost 23 years after he was shot. 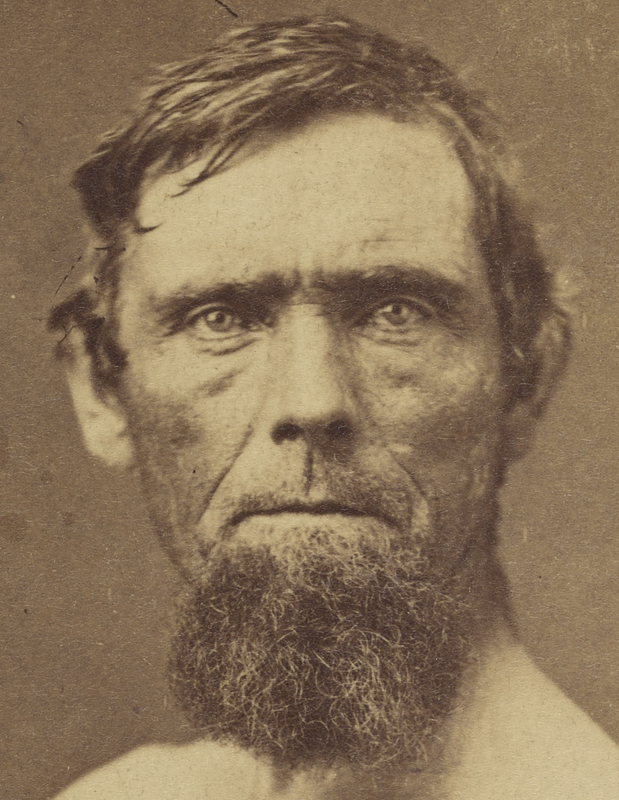 The story of his life adds greatly to the visual impact that his photograph imparts; by the time it was taken, those eyes had already seen and experienced so much in life, and borne witness to some of the most momentous times, moments and locations in Nineteenth Century American history. 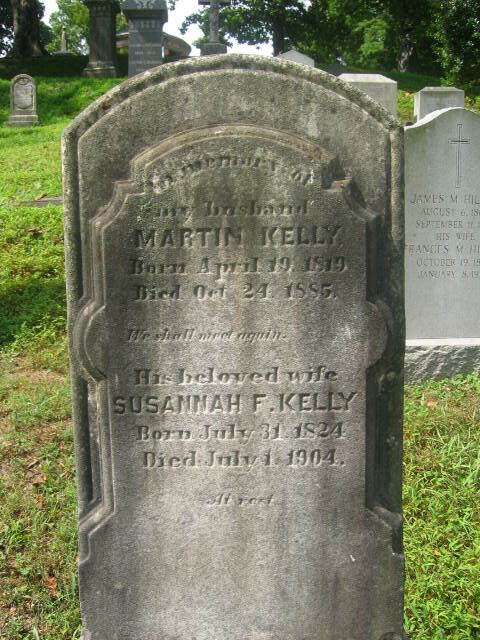 Martin Kelly was laid to rest in Oak Hill Cemetery, Washington D.C., where his headstone can still be seen. Inscribed underneath is the line ‘We Shall Meet Again.” His wife Susannah was interred with him following her own death on 1st July 1904.